The drought hitting the West is not just striking the continental US. That same weather pattern that’s sucking the life out of California is also making life hot, dry, and dangerous for the top third of North America: Alaska and Canada have seen little rainfall, soaring spring temperatures, and now, a record-breaking wildfire season. The smoke drifting from hundreds of fires can be seen in new NASA imagery. 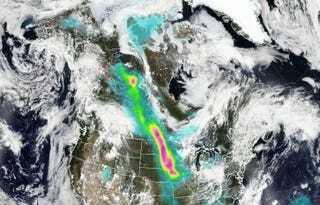 It forms a plume that extends all the way down through the Midwest, reaching as far south as Texas today. How many fires are we talking about? As many as 600. There are 297 fires actively burning just in Alaska today. That’s so many fires, in fact, that it’s hard to even tell where they all are on the state forestry department’s map. The fires come after an exceptionally warm few months in the region, with temperatures far above average almost everywhere. The difference here compared to other winters and springs was not just high temperatures, but how early these high temperatures started to appear in the season. Even Barrow—a city at the tippy top of the Alaska that you probably only know because it’s often reporting the lowest temperatures in the country—had a string of record high temperatures in May. Later in the month, the state recorded its earliest-in-the-year 90-degree day. On May 23 the temperature in Fairbanks was a record-breaking 86. On the same day, it was 83 in Phoenix. These early hot days have contributed to a lengthened fire season, meaning that the snow-packed forests which are usually saturated with moisture are drying out faster, creating a longer window when they will be susceptible to fires. The same thing is happening in other drought-plagued places like California, where the wildfire risk is exacerbated due to lack of precipitation. But the big difference in Alaska and Northern Canada is that some of this land burning is permafrost—land that should never be dry or warm enough to burn. A new report by Climate Central shows that Alaska’s fire season has lengthened by 35 days since 1950. That’s increased the chances for huge fire seasons like this year’s—in which fires are increasingly burning through the permafrost itself. That means Alaska is on the verge of tipping from a net sink of greenhouse gases to a net source, setting off a spiral: Global warming begets more fires begets more global warming.